The recently demolished Corlett Building on the campus of Cleveland State University (1935 Euclid Avenue) was originally home to a vehicle showroom constructed by The Cleveland Cadillac Company in 1914, a local distributor for the Detroit automaker. There were several other tenants in the building at the time that the location was used as a car dealership, including R.G. Miller Coal Co. and City Ice and Fuel Co. It later became known as the Corlett Building due to the land originally having been the site of the home and office space of Dr. William T. Corlett. Dr. Corlett was a dermatologist and physician in the early 1900’s, in the time of Millionaire’s Row. The building for the Cleveland Cadillac Company was designed by well known Cleveland architects, Knox and Elliott. It had an art deco feel to it, complete with gargoyles and sleek geometric lines and shapes. According to the former Cadillac Museum manager, Greg Wallace, the Cadillac branch offices were fairly similar in their basic design. It is unknown if Knox & Elliott served as the architect for all of the branch locations. As noted here, Downtown Chevrolet (or Luby Chevrolet) occupied the site after the Cleveland Cadillac Company from 1925 to 1965. In the 1970's, the Cleveland Recording Company moved into the building and even received an award from the Plain Dealer for their renovation of the space. 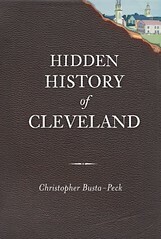 In 1977 Cleveland State University purchased the property. Unfortunately now, the building remains no longer. In past issues of The Cleveland Stater, there were several different ideas of how to utilize the building, but at the same time it was noted that the building could eventually meet its demise. In 2000, CSU's newspaper reported that the Corlett building could be demolished at some point. This seems confusing because in the same article it was also noted that the structure was part of CSU's master plan of development. In 2001 the structure was being looked at as a potential site for the partnership between CSU and WVIZ for the Advanced Digital Technology Center as well as the site for the bookstore. In 2003 the building was placed on the National Register of Historic Places. Unfortunately, this does not protect against demolition. One year later in 2004, the future of Corlett was addressed in the Cleveland Stater again. The Cleveland Municipal School district had a lease on the building through the end of 2005, and cost estimates for renovations for use by CSU were estimated at around $10 million. Nothing else appears to be noted by the campus newspaper about the building until the July 8, 2009 issue when the demolition announcement is made. The article indicates some of the architectural features were salvaged for use on the property in the future. For now, parking and a green space are slated for the site, followed by a farmer’s market, with eventual plans for a visual arts center. In the first three pieces I’ve contributed to this blog, coincidentally two of them are about buildings designed by Knox & Elliott. One of them has been demolished and the other is on the brink of disintegration. Taking into account the Northeast Ohio buildings credited to Knox & Elliott on the Landmarks Commission website, right now only 43% of the structures are still standing. This leads me to pose the following question; how many buildings do we demolish before we allow an architect’s imprint on our region to disappear? I shadowed a CSU creative writing professor back in 1998. Her office and classroom were in the Corlett building. At the time I thought it was just about the coolest building I'd ever seen. It's sad that CSU couldn't have used some of their immense renovation budget to do some restoration of the Corlett. I agree wholeheartedly. There are few buildings left on Euclid Avenue from the era of Millionaire's Row. It's truly a shame that one more is now but a memory. People from other countries visit America and note that respect for culture is not really in line with a first-world nation - sort of in between Europe and Africa, but not really fully civilized. You also have the ugliest cities in the world, and events like these make them even uglier. Your comment is saturated with arrogance. You fail to realize the history of Euclid Avenue, let alone Cleveland. Come visit our town and you'll be overwhelmed by the beauty of Severance Hall - an architectural and music hall masterpiece to this day, and one of the finest in the world. I've read your post "The demolition of the Cleveland Cadillac Company building". Thanks for sharing those info!